In classical music, especially the operas of Richard Wagner, a leitmotif refers to a musical phrase, melody, or flourish that is associated with a specific character or situation. The leitmotif can (re)introduce characters and situations as well as support recurring emotional contexts. In Star Wars (1977), for example, composer John Williams created musical themes for a number of different characters (Luke, Leia, Yoda, Darth Vader, etc.) and different settings (battles, fanfares, and marches). In literary works, leitmotifs are word phrases or patterns that are thematically linked to specific characters or settings. Similarly, nonspeech captions can link specific words or descriptions to specific characters at a level that is only available within the captioned viewing experience. For example, in Aliens vs. Predator: Requiem (2007), (guttural croaking) is repeated twenty-two times over the course of the movie and always in the context of the Predator’s animalistic noisemaking. No one in the movie utters the word guttural or croaking; these words only exist in the captions. Sometimes, viewers encounter the captioned description before they see the Predator. Given that the Predator is usually couched in darkness and sometimes resembles little more than a foreboding dark outline, (guttural croaking) becomes an identity marker as much as a description of a nonspeech sound. 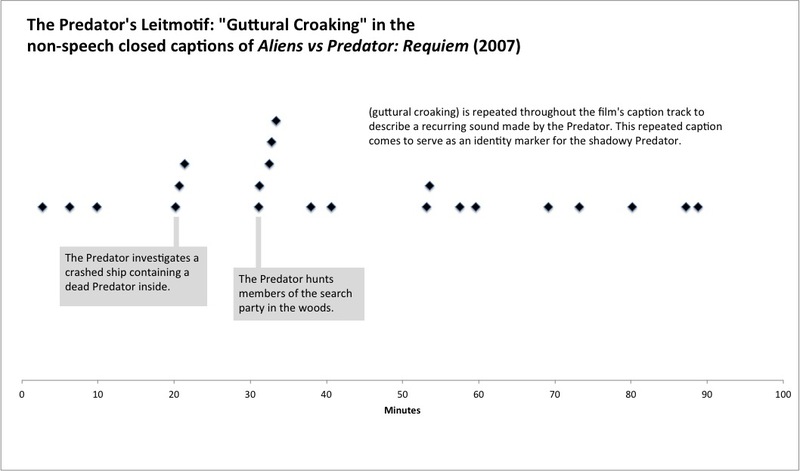 The recurring caption is the Predator’s leitmotif, as it repeatedly announces his presence in the narrative. Source: Aliens vs. Predator: Requiem, 2007. DVD. Featured caption: (guttural croaking). Every instance of (guttural croaking) in Aliens vs. Predator: Requiem (2007). DVD. Source: Aliens vs. Predator: Requiem, 2007. DVD. All 22 instances of (guttural croaking). Because the Predator is always couched in darkness, (guttural croaking) serves to announce his presence and define his identity when he can’t be seen clearly. For additional examples and discussion, check out my book, Reading Sounds: Closed-Captioned Media and Popular Culture.